It seems ironic that a pattern initially designed to help wearers blend in and disguise themselves has become one of spring’s hottest fashion trends. From apparel to footwear to accessories, this print is showing up on the runway and in the stores. Check out some of these well-known brands that are embracing the trend this season. Cole Haan has launched The Camo Collection for spring 2014, including bags, wallets, shoes, and socks. Products are offered in a classic woodland-inspired or mosaic-style print. With functional commuter briefs and portfolios, the line is perfect for the fashion-forward male executive. Apparel that hit the runway this year showcased an updated camouflage design. Evolving from traditional greens and browns, new color combinations took this print to a whole new level. 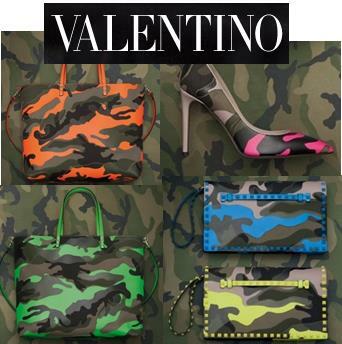 Notably, the Camouflage Fluo Collection by Valentino combines camouflage print leather and trendy fluorescent hues for a bold statement piece that is sure to catch the eye. 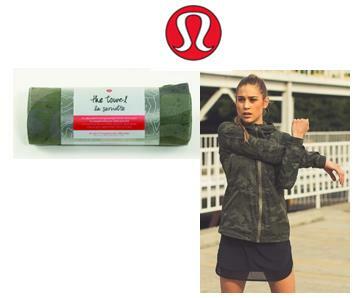 Lululemon has also jumped on the camo-inspried bandwagon. The yoga and athletic apparel company has introduced several new items including a microfiber camo yoga towel and camo running jacket. Nike SB, a full line of skateboarding clothing and shoes, will drop a new camo pack in the Zoom Stefan Janoski sneakers later this spring. Offered in desert khaki or a green camo version, watch for these shoes to hit the shelves of retail stores in the upcoming weeks. The camo trend is not only showing up on the pages of fashion magazines and runways, it’s increasingly popular for middle America as well. Take a walk through Wal-Mart, Kohl’s or JCPenney, and I’m sure you’ll find some camouflage print merchandise on the shelves. It’s no surprise when reality TV shows such as “Duck Dynasty” attract 8.6 million viewers and more than 4.2 million fans on Facebook. The characters’ laid-back lifestyles and love for hunting make them relatable to viewers. Each episode showcases full-on camouflage garb. 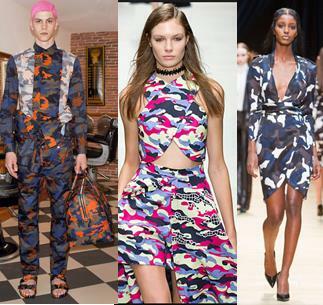 From high-fashion runways to everyday street wear, the camouflage trend is appealing to multiple demographics. Keep an eye out for spring’s must-have stand-out print: camouflage. You can shop ePromos for promotional camouflage items right here. Hot New Promos For Spring!